At the Cannes Film Festival, there’s a very small window to see a movie; each film screens a few times in one day, and perhaps once more the following day, and then it’s gone. If you missed the boat (or yacht, since it’s Cannes), too bad. This model builds rapid consensus. Certain movies are declared either great or terrible, and others simply dismissed. 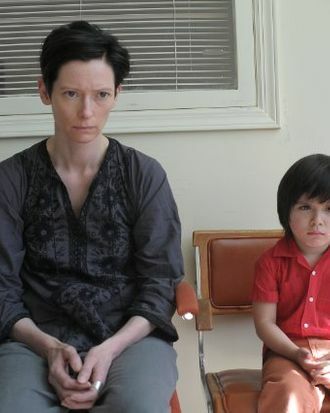 And in this still very early stage of the festival, the only movie everyone wants to talk about has been Lynne Ramsay’s very appropriately titled We Need To Talk About Kevin. From the opening shot, an overhead view of a tight, swaying sea of bodies covered in chunks of red (it’s a tomato-throwing festival Tilda Swinton’s character is attending in Spain), Ramsay’s first film in ten years sets up an unceasing tension; in every beautifully conceptualized, red-soaked frame, one cannot shake the feeling that violence is ahead. In Spain, Swinton’s character is at home in the stuff, swimming through the tomatoes in rapture, even being carried through them as if on a crucifix. Years later, when a gaunt version of the same woman walks out of her sad suburban house, wearing a conservative business suit for job interviews, the color is menacingly splashed in angry strokes of paint across the front of her house and her car. This broken woman tries to rid herself of the stain by sanding and scraping it away, but with every cleansing effort, red dust settles on her skin, and she must scrub it away again. It’s a masterful way of introducing the audience to this woman and her misery. How did she get here? What has she done? Is it her fault? Can she ever move on? Based on the novel by Lionel Shriver about a mother coming to terms with how her son, the titular Kevin, committed a high school massacre, the subject matter alone was controversial enough to have stirred up conversation. (Interestingly, Gus Van Sant’s Elephant, also about a Columbine-like rampage, won the Palme d’Or in 2003.) But the most polarizing factors about Kevin seem to be about execution rather than plot: Did Ramsay manage to help us understand why Kevin does what he does? Did she make us feel empathy or contempt for Swinton’s Eva? Was this a story about bad mothering or inherited sociopathy? Was Ezra Miller’s performance as Kevin one-note evil or a nuanced portrait of a troubled kid trying to earn the love of his mother? (Everyone agreed the little kid who played him as a toddler was one-note sadistic.) Was the movie really just a high-brow reinterpretation of Chuckie or The Omen? 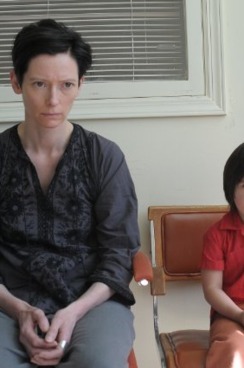 Is Tilda Swinton a lock for the Palme d’Or Best Actress award or simply the strongest contender thus far? Among the many people we spoke to over the last two days — often at screenings and parties for other movies that were gone from memory the second we’d watched them — half adored Kevin and the other half hated it. No one, though, could stop talking about it.